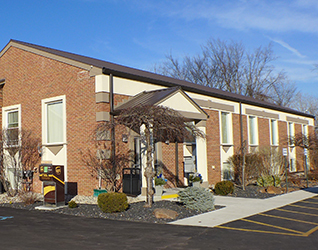 Spacious office building that is currently being used for a medical office. Building consists of 2 suites - Suite A: large waiting area with fireplace, 3 doctors offices, each with a private bathroom. 2 Other bathrooms for patients and staff. A total of 5 exam rooms, large procedure room, lab area, spacious reception area & plenty of storage space. Suite B: Spacious waiting area & front office area, large doctors office, 4 exam rooms, x-ray room with dark room & large bathroom with stand-up shower. Building has been well maintained, located on 1.23 acres & so much more!! Located at the corner of Graham & Calkins Rds. Convenient location - easy access to all amenities.